Our self catering apartment in the heart of historic Carcassonne is available to let all year round. It is ideal for anyone planning a vacation in the South of France, or for anyone visiting the historic city of Carcassonne. It is a well appointed, exceptionally light, third story penthouse with three bedrooms and a terrace. Broadband is available. Click on the following link for more details and photographs of the Apartment. The apartment is located in the heart of Carcassonne, a southern French city of exceptional character and beauty. All of the attractions of the city lie within easy walking distance. On the doorstep are cafés and brasseries, typical Southern French shops, a weekly market, a theatre, a cathedral and numerous buildings of hstorical interest. The modern city is built around two medieval cities, the original hilltop Cité on one side of the river Aude, and the thirteenth century Bastide on the other side of the river. Carcassonne is within easy reach of the Mediterrannean Sea with its famous beaches, and of the Pyrenees mountains and their winter ski resorts. The flat lies within the ancient bastide of Carcassonne, founded by and named after Saint Louis, a thirteenth century king of France. Within a few hundred yards of the apartment you will find restaurants, brassieres and bistros, tabacs (newsagents), boulangeries, patisseries, delicatessens, vintners, butchers, historic churches, antique shops, pharmacies, a market and a post office. It is also within a few hundred yards of attractions such as Porte Monumentale des Jacobins, the Theatre Jean-Alery, the Musee des Beaux Artes, the Cathedral of Saint Michel, Place Carnot (the central square), public gardens, and a number of spectacular Renaissance town houses (known in French as hôtels particuliers). Two of them, one now the town hall lie just over the road from the apartment. Click on the following link for more details and photographs of the Bastide de Saint Louis. Just over the River Aude you will find the medieval cité, the largest medieval European city with its city walls still intact, a UNESCO World Heritage site. This is one of the most popular tourist destinations in France. Click on the following link for more details and photographs of the ancient walled cité of Carcassonne. For well over two thousand years Carcassonne has been a cross-roads on routes linking Spain to Italy, and the Atlantic Ocean to the Mediterranean Sea. It is ideally located for visiting vineyards, markets, picturesque hilltop villages, Mediterranean ports, Cathar Castles, historic churches and abbeys, and the Pyrenees mountains. The Canal du Midi, another UNESCO World Heritage Site, passes within walking distance of the apartment. 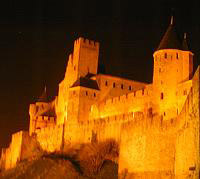 Carcassonne is the capital of the Aude departement "Le Pays Cathare" - Cathar Country. Click on the following link for more details and photographs of the Aude departément. Carcassonne airport lies just outside the town, less than ten minute's drive away from the apartment but far enough away that aeroplanes can not be seen or heard from it. The penthouse is also walking distance, or two minutes' taxi drive, from the central railway station.